To fuel my Superwoman superpowers, not just any food will do. Oh no. I must eat… Superfoods! Luckily for me and my superpowers, most so-called “superfoods” happen to be friggin’ delicious. Take sweet potato, for example. It’s ridiculously good for you, full of potassium, calcium, iron, vitamin A, vitamin C and so on…. but it’s basically potato-shaped pudding. Because sweet potato is naturally so sweet, it makes sense that it’s usually served as a sweet side dish, covered in butter and sugar or mini marshmallows. I actually prefer savory sweet potato dishes, though, where the sweetness is toned down a bit and takes on an earthier quality. It’s even better if there’s a bit of spice involved. Anyway, back to the superfoods and my new favorite sweet potato recipe. This recipe is great because A) it’s delicious, and B) it’s superfood stuffed with more superfood. 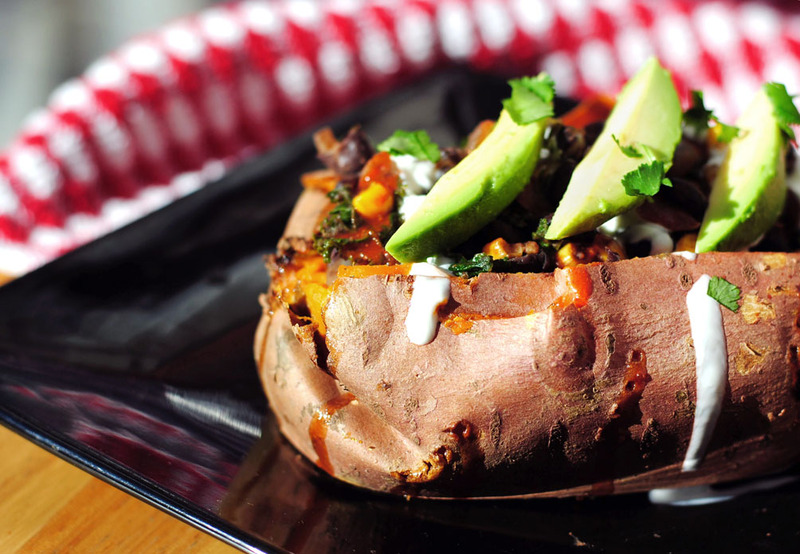 Black beans, kale and avocado, served up in a tasty sweet potato boat. It’s the perfect lunch for those days when you’re feeling a little bit drained but still have bad guys to vanquish and puppies to save. We’ve all been there. Like all of my favorite recipes, this one is infinitely customizable. Season as you like, substitute anything you want... it's pretty much foolproof! Preheat oven to 425ºF. Wash sweet potatoes, dry thoroughly and prick several times with a fork. Place directly on middle oven rack, with a sheet of tin foil on the lower rack to catch any juices. Bake for 45-60 minutes or until tender. Let cool before handling. 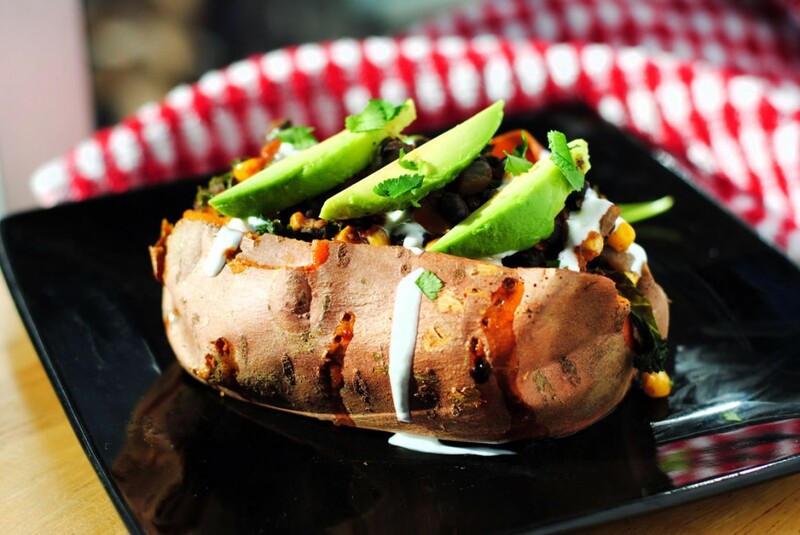 While sweet potatoes are in the oven, prepare filling. Sauté onions and garlic with a bit of olive oil until onions are tender. Add kale and a few tablespoons of water, and cook until kale is wilted. Add black beans, corn and spices, and cook to heat through. Season with salt and pepper to taste. When sweet potatoes are finished and have cooled slightly, cut a slit down the middle of each one and squeeze the ends to open. Sprinkle with a bit of salt, if you want. Add filling and top with garnishes. Voila! wonderful idea! cooking this tonight! thanx!